4 Fun and Engaging Writing Center Ideas! Freebie Alert! | Primary Planet! 4 Fun and Engaging Writing Center Ideas! Freebie Alert! My writing center is the hub of my classroom! It is everyone's favorite spot! Read on to find 4 fun and engaging writing center ideas! Pssssstttt...keep reading, I think I see a freebie in your future! This post does contain affiliate links. If you use the link I will recieve a small comission at no cost to you. Thanks so much for your support. The writing center in my classroom is a combination of Paper Storage and Maker Space. The kiddos get what they need or want, then find a spot in the room to do their writing or making stuff with writing! They love it! 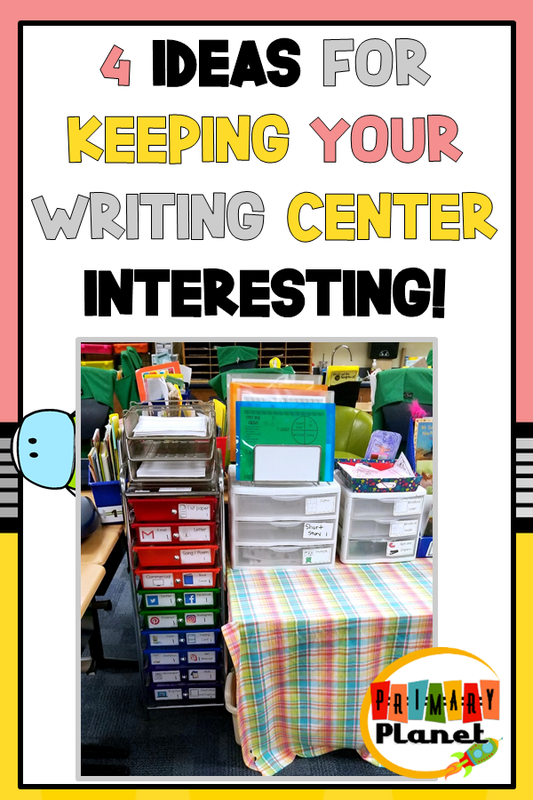 But I do have 4 Fun and Engaging Writing Center Ideas to keep your writing center fresh and interesting! 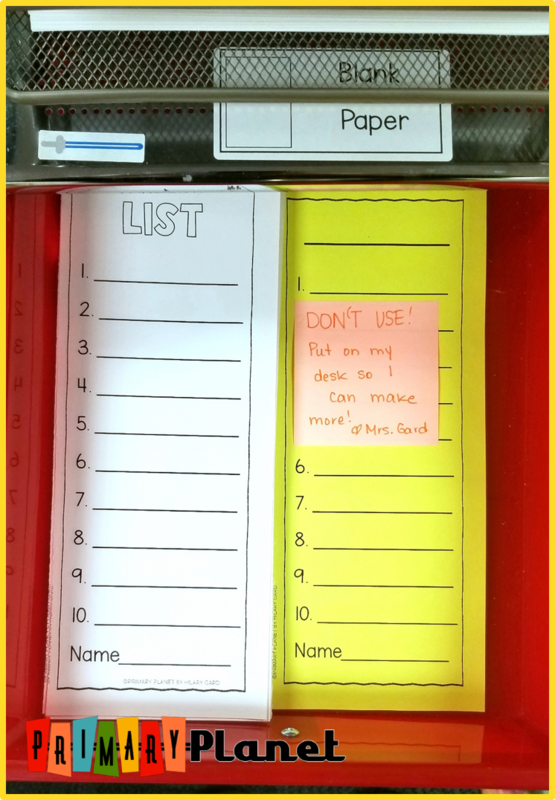 Writing Center Idea #1: Paper! Of course, your writing center needs paper, but what kind of paper does your writing center need (say that 3x quickly :)? You can use any paper that the school provides! I use blank paper, story writing paper, graph paper (both large and small squares), lined paper and construction paper! I am sure that your students will find multiple uses for any and all paper you put in your writing center. I show the students where they can find it, different things that they can do with it, then let them go! I like to put different varieties out at different times in the school year, or when the need arises naturally! This year I have a darling cherub who LOVES Pokemon. He LOVES to make Pokemon cards. So, one day I interested him in trading card paper. I showed him how to use it and he became the expert. He showed the other interested kiddos how to use it and they are Pokemon card making machines! They also do research using my Pokemon guidebooks to make their cards authentic, or they make up their own! It is a favorite in my classroom! You could easily make your own "cards" by cutting card stock, construction paper, or regular paper into fourths. Show your students how to start with the name of who (or what) the card is about, a place to draw a good picture, and space for information about the subject of the card! One of my little girls wanted to make a birthday card for her little sister, so I introduced her to the card making paper! The same thing, she became the expert and showed others how to use it! This also helps the kiddos take ownership of the writing center and they help me maintain it! You could also show your students how to fold a piece of paper in half and make a card that way! Looking for all kinds of fun paper to use in your writing center? You can find TONS of templates in my Writing Paper Templates product! They are all print and go, or print, cut and go. You can find that HERE! Be sure to put more list paper in the bin. Extra tip: I put an original of the paper type in the bottom of the draw with a sticky note that says "Put on my desk so I can make more". Then, I know when I need to make more! Unless of course, you have a very fastidious kiddo like the picture above who will send you an adorable "text" so you know when you need more paper. Yes, I realize that not everyone loves writing prompts. But, when I say Writing Prompts I mean fun, engaging, entertaining, writing prompts! One way to make writing prompts a bit more fun is to have a jar or container with different writing prompts written on slips of paper. Let the kiddos choose a slip if they need a writing prompt! Use pictures! You can find all kinds of fun pictures on the internet that you could print or show on your computer or Smartboard for your students to write about. Better yet, ask your students to bring in pictures of themselves, their pets, from magazines, that they have found online, and put them in your writing center for your students to write about! Use stickers. Put a few stickers on a piece of story paper and the children can incorporate them into their pictures then write about their picture. There are so many ways to make writing prompts a little more fun. The ones above are Pick a Prompts (you can read more about these fun prompts HERE. I print the color version, cut in half and put on a ring to save paper. Sometimes I print on black and white paper and put a stack of different prompts in the drawer! The kiddos LOVE them! You can find a plethora of fun Pick a Prompts HERE in my store! Enough for the WHOLE YEAR! Kids are natural storytellers, but sometimes they need a place to get started. This drawer also has my Story Starter cootie catchers! OH, MY HEAVENS do the kiddos LOVE cootie catchers. I can give them one of these and they will tell each other stories all day! They usually work with a partner, choose their setting, characters, and plot points, work together to make up a story, then write it down! Sometimes on short story paper, sometimes in mini-books or they do other types of writing with it! They are very versatile! If you would like to get some for your writing center, you can find them HERE! I have sets for the whole year! Now, you are probably thinking, those are difficult to make! This time I did a crash course for the whole class (in small groups so I wouldn't tear my hair out), then I had a few kiddos who already knew how to make them on their own. They are the cootie catcher experts and help the other kiddos out! I do have a few pre-made color ones in the drawer as well, but those have to be returned to the drawer when the kiddos are finished using them! What kiddo doesn't like games? Put that to work for you in your writing center! 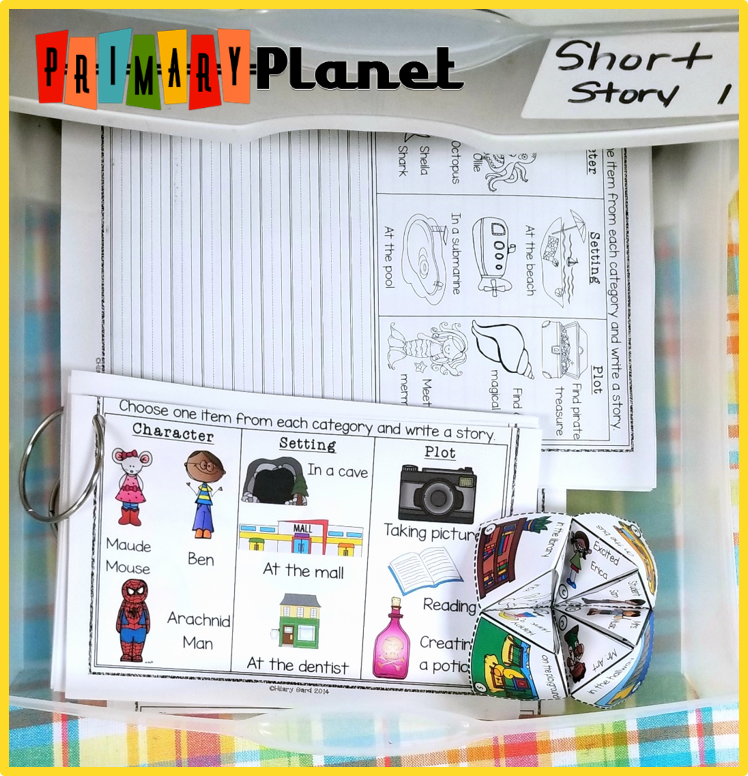 There are some fun writing games that I found online if you are looking for a paperless option! You can find many different genres of writing games HERE! Teach your kiddos how to play "Pass the story". All they need for this game is a piece of paper, a pencil each, and a clipboard. 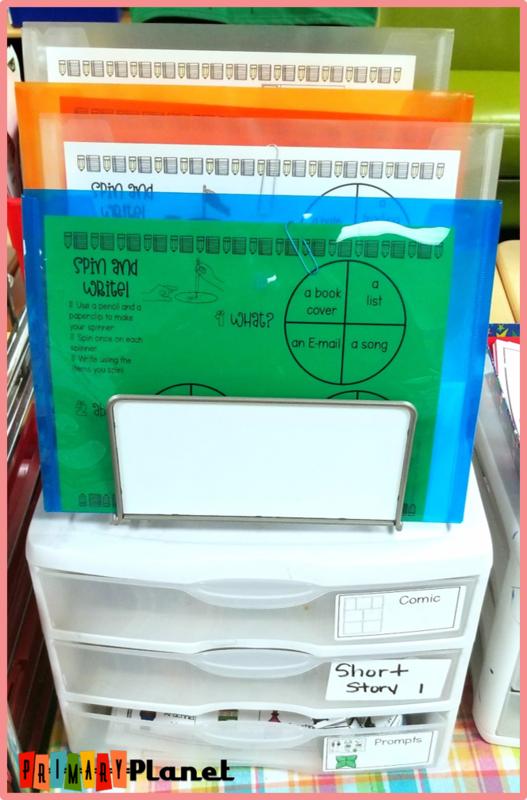 Clip the paper to the clipboard and have one student start a story. Then, he/she passes it to another student and they add one sentence. Keep passing it to all who are playing. If you only have partners playing, pass it back and forth! I didn't know whether to put my cootie catchers here or above, so Story Starter Cootie Catchers are a great game that your students can play! They LOVE them (as I mentioned before). Story Cubes! My kiddos LOVE story cubes. They roll the cubes and then use the items to write a story! 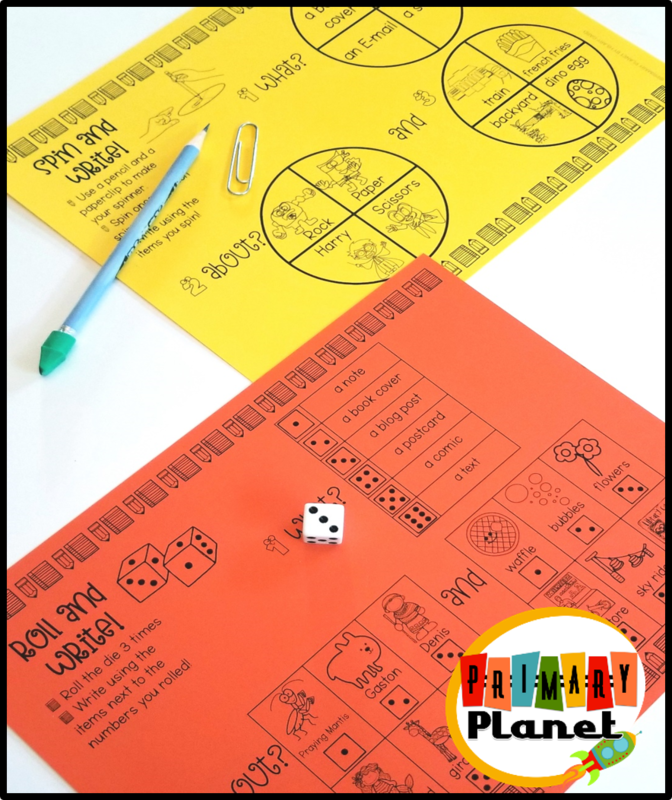 I also have Spin a Story and Roll a Story games in my writing center! For Roll a Story, it is exactly the same except there are more choices and they use dice! I have my kiddos play this near the writing center so they have easy access to whatever paper they need for their writing game. If you would like to check these out, you can find them HERE! 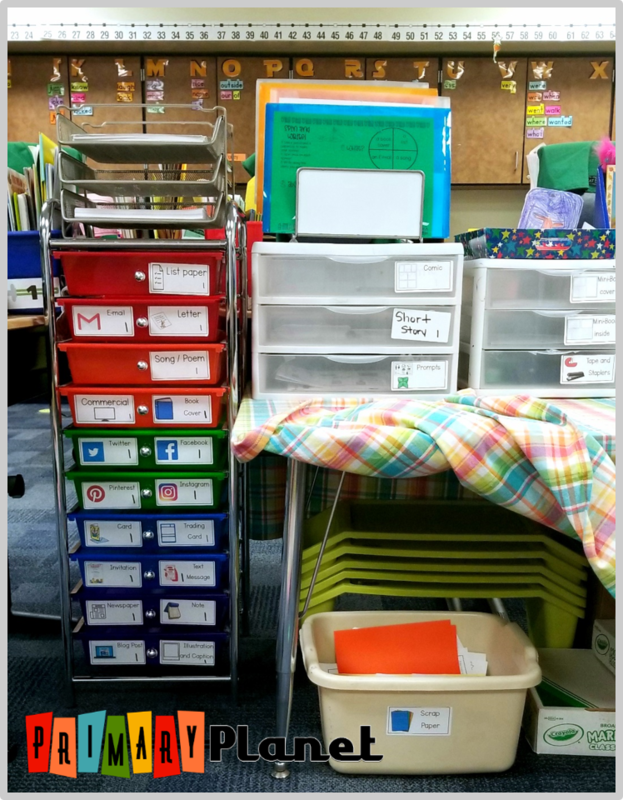 Writing Center Idea #4: Other Stuff! This might be what makes my writing center so much fun, at least in the eyes of the kiddos! I have "other fun stuff" that the kiddos can use when they are writing and making stuff with writing. What else do I have you ask? I try to add things periodically throughout the school year! Right now I have rolls of tape and staplers. I also have a "scrap box" that has "oops" copies or extra copies of things that we have worked on. They love cutting this paper up, cutting out the pictures or clipart, or pretending to play school with it! Plus, it cuts down on wasted paper! Great way to reuse! Things I like to add: portable writing desks, colored pencils, markers, fancy pens, envelopes, seasonal stationery, construction paper, and BOOKS! I love having books in my writing center! What kind of books? 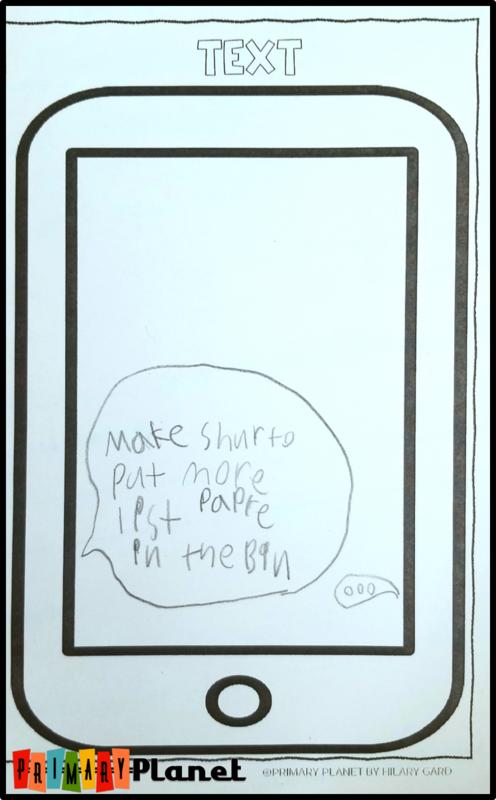 I have drawing books, how to make comic books and "Can you write like..." books. These are books that we have used in an author study or mentor texts where the kiddos can check out the author's style and craft and try to imitate the masters in their own writing! If you are looking for great drawing books, the fun Pokemon Books that I mentioned, or Story Cubes, you can find them through this affiliate link HERE! This is an affiliate link so I will receive a small commission with no cost to you! Thank you for your support! Looking for other great Writing Center ideas? You can find some excellent ideas in this BLOG POST by Foxwell Forest for Oriental Trading Company! So, now what you have been waiting for! Freebie! Sign up for my newsletter below to get the Writing Center labels, and the Mini-Book Templates that I use in my Writing Center! Read the post now, or save it for later! Sharing is caring and I appreciate it! 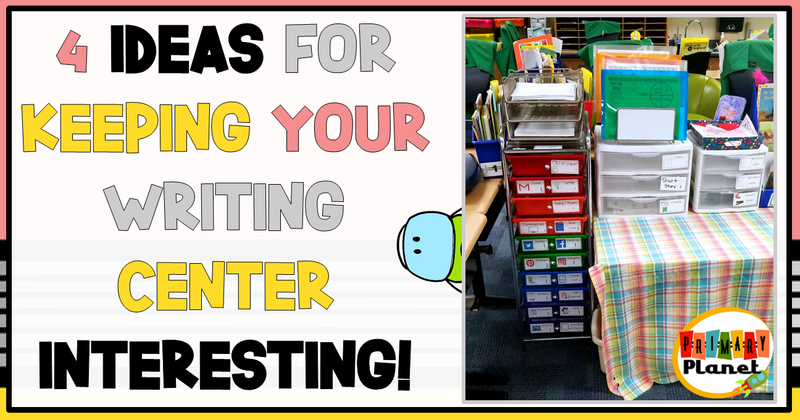 Thanks for stopping by to find some fun ideas to keep your Writing Center interesting!